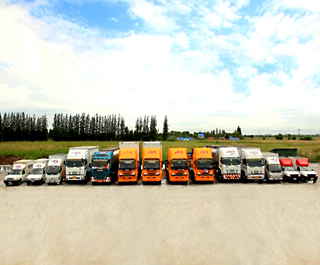 was established in 1996 focused on servicing the transport of commodities in the central region of Thailand. With a commitment to doing the work in a right and safe manner, using the best equipment available in the market, Mon started modernizing the transport industry in Thailand and set new standards for reliability and performance. Today, meeting the demand of our clients has led to the expansion of our services beyond distribution of general goods to include nationwide specialized transportation. MON is a recognized leader in gas- and petrochemical tanker transport, multi drop time specific distribution services, JIT and JIS manufacturing support as well as cold-chain distribution services providing our clients with the highest level of quality, safety and flexibility. leading transport companies. Our fleet counts more than 1,800 rolling assets from pickup-trucks to 22-wheel tarp-lined trailers and built-to-purpose petrochemical tankers. More importantly we have a strong team of highly trained drivers and specialist officers caring for every order we execute. Every vehicle is equipped with GPS devices for tracking, reporting, safety and security reasons. Our market leading TMS and proprietary FMS ensures our efforts are coordinated and supported by the best available tools. Our equipment and systems are always maintained to be at the leading edge of the market. We’re certified ISO 9001:2000, ISO 9001:2008, TIS 18001:1999, OHSAS18001:2007, DBD Certified and Q Certified. Beyond the certifications, our commitment to client satisfaction, safety, the harmony and welfare of our team and the environment is setting us apart from the rest. The foundation laid at the inception of the business is still the base of the philosophy at Mon Transport – improve, innovate and deliver. We keep setting the standard for world class performance levels delivered locally with unique Thai care and concern. Copyright © 2017 MON Logistics Group Co., Ltd. All rights reserved.